All fixed route services are available for free, in order to incentivize people to use more sustainable forms of transportation on days when the exhaust from driving affects people the most. 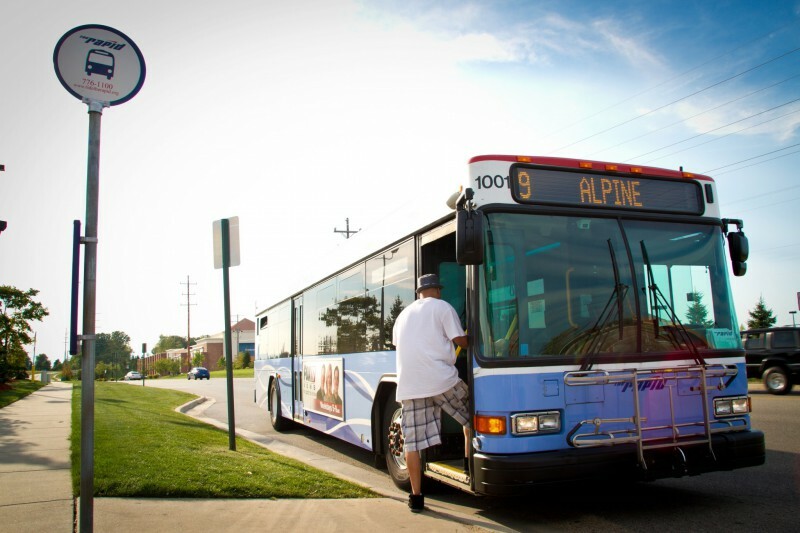 The Rapid’s fixed route buses are free on Clean Air Action Days, so when the West Michigan Clean Air Coalition (WMCAC) declared July 20th and 21st Clean Air Action Days, many bus riders celebrated the news. However, Clean Air Action Days are no cause for celebration. Clean Air Action Days occur when air pollution in the air reaches unsafe levels. Exposure to high levels of air pollution can cause serious health problems, including increased risk of heart and lung disease. Since much of air pollution is caused by fossil fuel emissions, Clean Air Action Days are meant to encourage people to cut down on activities that emit the fuels, including driving cars. The Rapid offered those free bus rides to entice people to make use of the more environmentally-friendly public transportation system instead. WMCAC called for the Clean Air Action Days Sunday and Monday because of high levels of particulate matter — a combination of solid particles and liquid droplets sometimes referred to as soot — in the air. According to the Environmental Protection Agency (EPA) website, particulate matter enters the air either through direct emission from sources, such as construction sites, unpaved roads and fires, or through complicated chemical reactions that occur in power plants, industries that combust fuel and automobiles. Once in the air, particulate matter can be carried over long distances by wind before landing. When it settles in lakes and rivers, it makes them more acidic. It also depletes the nutrients in soil, which damages crops and forests. In addition to these environmental dangers, particulate matter has been linked to serious health problems for people who are exposed to it. When it comes to particulate matter, the smallest particles actually pose the biggest threat. Due to their small size, these particles are able to slip past the body’s defenses and make their way into the lungs and even the bloodstream. Inhaling them increases risk of heart disease, lung disease, aggravated asthma, difficulty breathing, irregular heartbeat and heart attacks. "Clean Air Action Days are a great opportunity to think about how you get to work, or class. It offers an opportunity to reflect on what your transportation choice is doing to both the environment and to those around you, specifically those with respiratory issues," said Josh Leffingwell, Communications Director of the West Michigan Environmental Action Council. Particulate matter levels in the West Michigan air stood at 81 on the Air Quality Index (AQI) as of 9 a.m. on Monday morning. AQI measures air pollution on a scale that ranges from 0-300, 300 being the most polluted. A measurement of 81 on the AQI scale, which ranges from 0-300 — 300 being the most polluted — actually falls in the moderate range for air. But even moderate levels of air pollution can pose a serious health threat to people with higher sensitivity to air pollution, such as children, older adults, people who are active outdoors and those with lung diseases. WMCAC recommends that those who fall into theses high-risk categories avoid intense physical exertion outdoors when air pollution levels reach 50 or higher on the AQI scale. All citizens are encouraged to take basic measures to improve air quality on Clean Air Action Days. In addition to taking advantage of the free Rapid bus line, WMCAC suggests people carpool to destinations that can’t be reached by bus. And for shorter journeys, people are encouraged to bike or walk. Other simple steps include holding off on lawn work that requires a gas-powered lawnmower until air quality improves and refueling vehicles in the evening hours the day before an Clean Air Action Day. WMCAC hopes people will consider implementing these simple measures and other basic lifestyle changes to their regular routines to help keep the air clean enough that we don’t need more Clean Air Action Days. To learn more about what you can do to decrease air pollution, check out their website, www.wmcac.org, for more information.